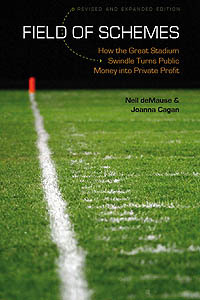 This entry was posted in Nashville Predators, Tennessee Titans by Neil deMause. Bookmark the permalink. The part about increased rent to cover T&I work (like the seats) is completely valid, but I do want to note that I am not sure the term “upgrades” should be tossed around loosely in this context. In the case of a 20-year old facility, the HVAC and electrical systems (distribution and lighting) are probably nearing the end of their useful lives. Replacement systems are bound to be improved over 20-year old technology in terms of efficiency and may well be no more expensive than the old systems were when they were installed. It’s going to sound like an upgrade – and probably be cheaper to operate like an upgrade – but it should simply be considered repair by replacement. And no, one doesn’t demo and replace a 20-year old building because it needs new light fixtures, any more than one rebuilds one’s house when the central heater goes down. OK, so I finally read the original article and my comment stands. I would question the details about the ticket office renovation, but roofing repairs are definitely on the owner (city). Most of what is being requested isn’t unreasonable or unexpected. And this is yet another reason why taxpayer-owned sports facilities can’t be expected to pay for themselves and why the commitment should be questioned before ground is broken in the first place. Well, the question here is whether you consider these public buildings, or private buildings that were placed under public ownership to duck property taxes. If the latter, the teams should arguably be on the hook for upkeep – if the former, the city should arguably have more control. We’re agreed that this is something that needed to be addressed in the lease, though. People always look at the headline construction costs, but the lease is usually where much of the real money is. I wonder what the lack of a Los Angeles threat does to the Titans situation. They could threaten to move to London, but if the NFL opens the door to Europe, there’s nothing Nashville can do to keep them anyway. Tottenham Titans already has a nice ring to it. Well, after this weekend’s Battle at Bristol with VT and Tennessee and the helpful overlays of how many stadiums would fit inside the track at 150,000 tickets being sold, I think the obvious solution is to add a field and rink to the middle of the Fairground Speedway and sell tickets like crazy. If they can suspend that giant video screen then they’ve probably got the ability to hold a tarp over the field when needed. I’ll start arguing that it’s 20 years old and time for a new one. I mean, I’m available to do that. Any time. Just call. 1-800-publicstadiumcash. I was an Oilers season ticket holder and remember when Bud took his toys to Tennessee. Bud screwed the tax payers of Harris County to get improvements to the astrodome and left us with the debt. I remember reading the deal thinking Nashville is gonna regret it, and they are now. Hope you are getting everything you deserve.